When I think of French toast, I think of delicious weekend brunches filled with laughter, family and friends, and of course, incredible food. I had a craving for this classic brunch staple last weekend, and decided to go all out with scrambled eggs, fresh fruit, turkey bacon and fluffy French toast smothered in warm maple syrup. Yes, it was amazing. There are many different methods in preparing French toast, milk vs. heavy cream, more eggs vs. more milk, fried in a skillet vs. baked in a casserole, the options seem endless. 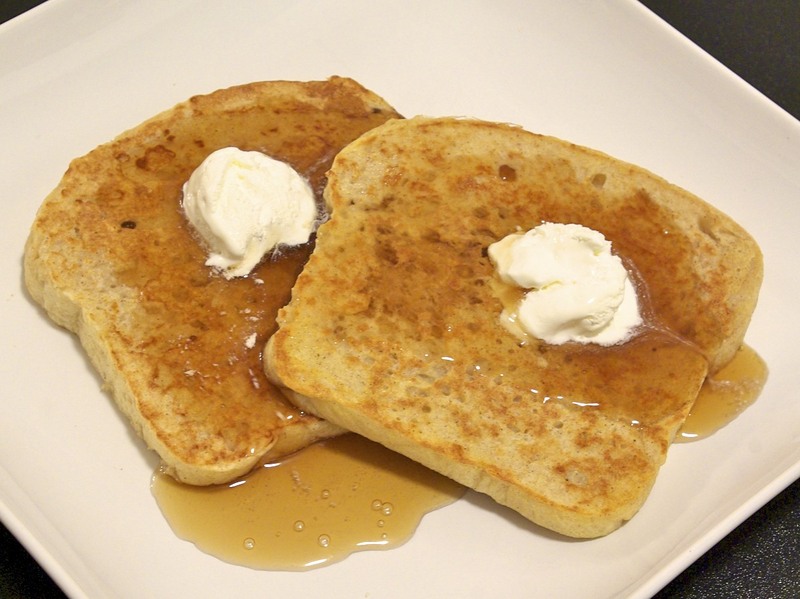 Well today I want to share with you my favorite method for light and fluffy maple French toast. With flour, cinnamon, maple extract and brown sugar, this recipe yields an incredibly flavorful and perfectly fluffy French toast. Just remember, French toast is only as good as the bread that you use, so homemade bread, left over challah, or any other bakery style bread is generally the best. Enjoy! What is your favorite thing to order at brunch? Let me know below! Preheat a nonstick skillet over medium low heat. In a large bowl whisk together flour, salt and cinnamon. Add in milk, eggs, extract and sugar, whisk until fully incorporated. Lightly spray skillet with cooking spray. Re-whisk milk mixture and dip both sides of one bread slice, shaking off excess. Be sure to re-whisk each time you dip, otherwise the flour will likely settle to the bottom. Lay bread in skillet and let brown evenly on both sides. Remove and keep warm. Repeat with remaining bread slices and enjoy! This sounds so warm and comforting…takes me back to my Grandma's kitchen. What a wonderful memory; I love foods that can do that. I'm a fan of the maple extract addition. That sounds really good. Did you bake that bread in the photo? It looks like it has a nice texture. Thanks! The maple extract adds just that extra maple warmth, it's pretty tasty. Yes, I made that bread and I am hoping to get the recipe up on Saturday. It's my go-to sandwich bread, I make it at least once a week. I help busy women find time to live well, get moving, eat right, and feel great, both inside and out. Learn more here!